Perched on the alpine slopes above Medran in an idyllic location with uninhibited views, Chalet Kewanee is a stunning, five-bedroom gem. With interior cladding in antique wood, Chalet Kewanee has been designed with Swiss alpine luxury and relaxation in mind. 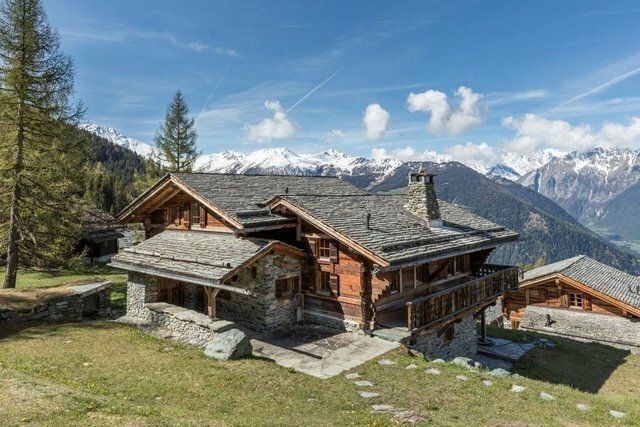 This five-bedroom, 340m2 chalet is perfect for entertaining friends and family. Anchored in the slope of the mountain at the edge of the forest, the views from the living space balconies, top floor bedroom and the garden bedrooms are unequivocal. With a private sauna, designated ski storage and direct underground parking Chalet Kewanee is well equipped with the luxuries of alpine living. This property is available for purchase by international buyers and can be used as a primary or secondary residence. The iconic Swiss resort of Verbier, with its world-class terrain and legendary après-ski, remains among the top ski destinations in the Alps. Situated in a sunny, south-facing bowl with spectacular views of the surrounding peaks, Verbier is less than 2 hours from Geneva Airport, close to the borders with France and Italy. Verbier is the main gateway to Les 4 Vallées ski area that features a sophisticated network of cable cars and gondolas providing easy access to 410km (255 miles) of marked runs, as well as some of Europe's best lift-served off-piste skiing. With its shops, restaurants, hotels and stunning views, but also with a nightlife second to none, Verbier attracts people from all over the world for unforgettable holidays. Thanks to the exceptional quality of life, events and services which include a private international school and a world-class classical music festival, Verbier is the home to a growing international community.